The subject I’ve selected do discuss this month is certain to prove controversial among lifters and bodybuilders alike, especially the latter group. The question of how heavy to train has always proved perplexing to bodybuilders, particularly to beginners. 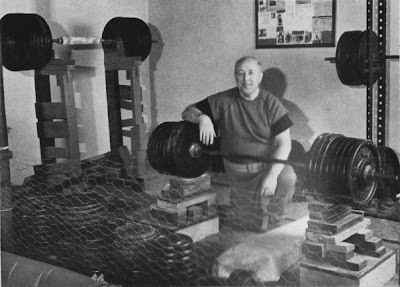 It has also been the subject of much discussion and debate among barbell men for as long as progressive weight training has been known, and yet no one has come up with a simple solution to end the confusion . . . at least not to the satisfaction of everyone. This problem, how heavy to train, is individual and usually depends on what one hopes to accomplish by his training. If the trainee seeks to improve his general musculature and physical efficiency, which is usually the case, then regular barbell training with medium-heavy resistance would do much to help him achieve his objective. Conversely, if he entertains greater ambitions of strength and lifting prowess, he must be willing to train heavy, much heavier than he would if training for merely physical fitness. So it’s obvious that this problem is individual and the decision rests on the ultimate goal one hopes to attain. It’s also true that when light training is followed for conditioning, an occasional heavy workout should be included to keep the strength of the muscles, tendons and ligaments at a high peak. Moreover, heavy training tends to stimulate the lesser used fibres and thus encourages fuller and better muscle contours. Lighter weights, on the other hand, can work the muscles very efficiently but only when the exercises are performed correctly. Medium or light resistance should be employed for increasing speed and to perfect lifting form. In this regard light training is certainly not to be overlooked if one hopes to excel at lifting. And where greater power is desired the overload and power plus principles outlined in the “York Advanced Methods of Training,” pages 23 and 28, are practical for this purpose. However, in keeping with development of greater power the Isometric-Isotonic method of power training simplifies this approach and makes it possible for many to beget increased strength. 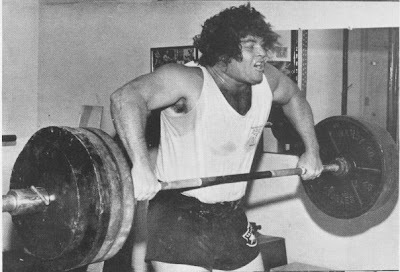 In defense of heavy training let us use some of the champion lifters as examples. These champions, we all know, must train heavy most of the time so their muscular power remains at a peak. However, even these men occasionally employ a light training day that helps to keep their muscular coordination keen, their lifting speed swift, and the lifting form perfect. But heavy training is employed chiefly to keep the muscles strong so they are capable of handling heavy weights without any difficulty . . . which is what makes a champion! At this point it might be proper to mention that if a lifter lacks good lifting style his poundage is sure to suffer, and under the circumstances he should use less weight to perfect his lifting form. Using heavy weights does not help to improve one’s lifting style. If anything it makes it worse because one is apt to depend on actual “muscle strength” instead of muscle coordination and speed to overcome the gravity of the weight. Using lighter resistance and practicing lifting does not impede body speed and results in better lifting style. Most lifters follow this type of training – heavy weights to keep their muscles toned up for greater power, and light training to add more speed to their movements and improve their lifting form. Recently I received a letter along this line from a 46-year old man who wanted to know how he could acquire more squatting strength. His best performance was 260, but this he has managed only on a few occasions. Now he has made several repetitions with 250 pounds on numerous occasions, but when he attempted 265 he was unable to recover. He also admits that there are times when 250 feels very light and he is capable of doing high repetitions. But there are days when even 240 proves to be a challenge. He squats about twice a week and has been training for five years, and has failed to make any improvement with his squatting in well over a year. How can he increase his squatting poundage, he asks. The problem as I see it is not unusual. Almost anyone who has trained for any length of time has had days when the weights feel unusually light, and at other times feel extra heavy. This is natural and usually reflects the mood you’re in. For example, if you are genuinely enthusiastic and anxious to train, the weights always feel lighter at such times. But when you lack ambition and the desire to train, the weights will feel very heavy. So when this man writes that he can do several repetitions with 250 and fails to do at least one with 265, certainly this would indicate his lack of confidence in his ability. I’m inclined to think that he has a mental block which prevents him from exerting his full strength when he attempts 265 in the squat. If he had complete confidence in himself he would be capable of putting out more effort when he needed it, and thus succeed with the weight easily. In order to acquire this confidence he must first overcome his fear of the weight. To do this he should practice quarter or half squats using a much heavier weight than he can squat fully with. This will build his confidence. At the same time his legs, knees and hips will get stronger from these partial movements especially if the heavier weights are employed. Of course it’s not difficult for any man to do half or quarter squats with 400 or 500 pounds if he is capable of doing a complete movement with 260. And, as a matter of fact, any time you support or handle a heavy weight for a few repetitions and then reduce the weight to about half, which may still be your limit, you’ll find this weight lighter!!! I know. I used this same technique in my early training. Whenever I failed to clean a weight that was near my limit, I never grew discouraged but quickly loaded the bar to a heavy poundage and did a few deadlifts with it. Then I unloaded the bar to the previous weight that I failed to clean and, lo and behold, the weight would almost fly up. It’s because the muscles were taxed by a much heavier load and so were geared up to exert greater force. Reducing the weight found those same muscles ready to exert just as much effort as before, but because the weight was reduced, it felt lighter than the first time. Of course, bear in mind that you do only a few of the heavier reps to, in effect, condition the muscles to the effort. If you continue to do a lot of sets and repetitions with the heavier weight you’ll end up not even getting the original lighter weight off the floor. You’ll be too tired. But a few fast repetitions (speed with this heavier weight is important), then back to the weight you failed with before will make a big difference. Try it and see. Try it on other exercises as well. Getting back to the lifter: we all know that he must train regularly to stay ahead of his competitors or be overtaken. But the fellow who seeks only to improve or maintain his physical condition doesn’t have to fight competition, consequently doesn’t have a real purpose to use the heavy weights all the time. For one thing, he may develop a “fixation” in his mind that he will never handle certain poundages, and this may often put a damper on his efforts so he is unable to exert his full force. 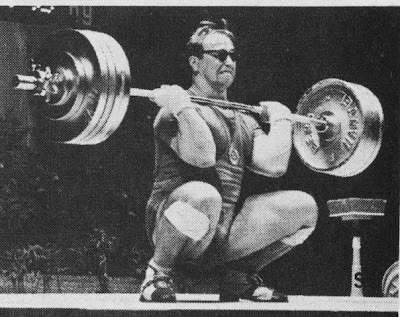 The 46-year old man mentioned earlier may never surpass his 260 pound squat unless he assumes a more positive mental approach by including the half-squats also mentioned before, or by employing a heavy straddle lift. This heavy training will help him lose his fear of certain weights and, because he’ll be handling much heavier weights in the half squat, he might attempt and even succeed with 300 in the squat. It’s possible once he establishes confidence in himself. But older men are more prone to injury than younger men so should spend some time in thoroughly warming up their muscles before attempting a limit lift. Many men inquire if they must train heavy to develop certain muscle groups. To develop muscle it’s not necessary to follow heavy training all the time, but an occasional heavy workout is required to stimulate the deeper muscle fibres that remain inactive when light training is practiced. MUSCLES, HOWEVER, CAN BE DEVELOPED BY MEDIUM-HEAVY RESISTANCE, BUT STRENGTH IS ACQUIRED BY HEAVY TRAINING. Those who are confused as to how they should train might find the solution by employing the old principle that has been widely used by many – the heavy, light and medium training system. The heavy system to increase muscular power; the medium system to build muscle; the light system to develop speed, coordination and improve conditioning. This training system involves all the phases of training and one is sure to obtain maximum benefits and satisfaction by using this method. So whether you should train heavy depends on what you wish to accomplish, and how hard you intend to train to obtain your wish. Whether you hope to reach any particular goal or not doesn’t matter, but it is a good idea to take a heavy workout once in a while to keep the muscles at their peak. So regardless of your goals include this type of training when you feel the urge to do so. You’ll enjoy it more and feel refreshed after you’ve finished. It’s all in the way you feel and the mood you’re in . . . follow your mood.